We received this press release today and thought it was worth noting. We’ve brought you coverage of AMD’s Never Settle bundles and now it’s NVIDIA’s turn. While it’s not a large multiple-game bundle, it’s nice to see NVIDIA including an actual game instead of some easily spent and not really tangible free to play game credit. SANTA CLARA, Calif.—July 9, 2013—NVIDIA today announced it is working with Ubisoft to deliver the most dramatic and intense gaming experience possible for Tom Clancy’s Splinter Cell® Blacklist™. 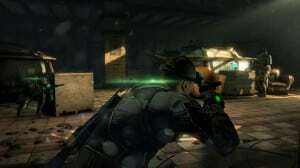 And starting today, gamers who purchase a GeForce GTX 660, 660 Ti, 670, 680, 760, 770, or 780 from a participating partner will receive a free copy of Splinter Cell Blacklist Deluxe Edition for PC, which will be released on August 20, 2013 in North America. They also sent along a screenshot, which looks pretty sweet. As mentioned, starting today, this game is included with most cards in NVIDIA’s lineup (GeForce GTX 660, 660 Ti, 670, 680, 760, 770, or 780). The game isn’t released yet and is slated for August 20, 2013, but people who buy one of those cards can be among the first to play it. I bought the cards a week ago. Will it work for me or it's only from now on?